Morbid Angel's first album since 2003's Heretic is bound to divide listeners. Those who love the band's earliest records -- Altars of Madness, Blessed Are the Sick, and Covenant -- are bound to see Illud Divinum Insanus' experiments with industrial (the Laibach-esque intro "Omni Potens," the Marilyn Manson-meets-Tim Burton "Destructos vs. the Earth/Attack" and "Radikult") as betrayals of everything the group once stood for. But Morbid Angel hired Laibach to remix some of their tracks way back in 1994; this isn't new territory for them. And many of the songs on Illud ("Existo Vulgoré," "Blades for Baal," "Nevermore," "Beauty Meets Beast") are as raw and savage as anything the band's ever recorded. And Trey Azagthoth's guitar solos, always one of the group's primary attractions, are wild displays of virtuosic technique, just as they've always been. The other big change, of course, is that the band's drummer, Pete Sandoval, is absent for medical reasons, with his seat being filled by Tim Yeung (Vital Remains, Divine Heresy). Yeung does just fine, unleashing double bass barrages every bit as brutal and precise as Sandoval did on the group's earlier albums. 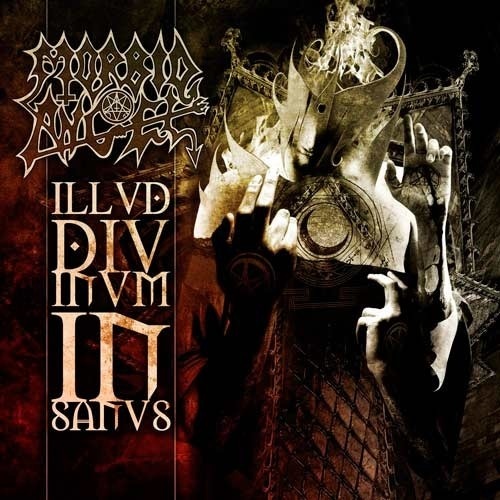 Illud Divinum Insanus isn't a stumble for Morbid Angel; it's a left turn by a band that's already made many of them throughout its over 20-year career.